Seeking. I think that particular forms of music, and of art in general, lend themselves to the displaying of particular qualities far more than others. If you look on a Hip-Hop blog or read a writer of that genre, I'd like to think that while we may have some similarities, that our perspective and EXPECTATIONS come from a different place. The standards of what is 'good' and what is not would be different, outside of just personal tastes and the levels reached before you can declare something a 'success's would also vary and that is a 'good' thing. And, at least presumably, it would be the same each time you changed genres and, again, that's a very nice thing to have such a wide variety of changing characteristics when the people who listen to it, support it and produce it are ever-changing works in progress ourselves. One of the things I believe that Reggae music showcases resoundingly well is the kind of hard-working, sometimes struggling (sometimes not) and persevering archetype of an artist who plies his/her trade under virtually any set of circumstances. When you take into consideration the nature of the music, especially Roots Reggae music, and the messages and subjects it captures, this come through in a major way and it is a very charming and delightful aspect of what I (and likely YOU) consider to be the greatest and most powerful genre of music in the world. Even more fascinating is the fact that artists of all levels -- be it bona fide stars or the very early up and comers -- can be a part of this at any point in their respective careers and some even seem to revel in it. On the absolute highest end, in Reggae circles, I think of individuals such as Norris Man who, whether you realize it or not, has had such a powerful and just fantastic career, yet you may not immediately think of him in the same way that you think of someone like a Sizzla Kalonji, Capleton or a Luciano. But if I asked you (or asked the man himself) to think of some of the other artists who came up at the same time, many of them are LOOOOOOOONG gone and had nothing to offer the world in the way of longevity for one reason or another, but it's 2016 and not only are people still singing songs like (the very fitting for the sake of this review) 'Persistence', which is well on its way to being twenty years old, but each and every year he gives us new songs and new albums to sing as well. I could well place others such as Bushman and Turbulence and Jah Mason in a similar category and others still who just really go to demonstrate how far hard work (and GREAT, MASSIVE skill as well) can take you in a genre and field such as Reggae music. Today we have the very, VERY rare opportunity to take a look at someone else who falls into this category and in a very unique way as for the first time in… several centuries or so, the Burning Spectacular has been reignited and is on our radars in a big, big way. Spectacular is someone who has fully taken advantage of the modern age of Reggae music and I don't mean that in a technological TWITTER-ish type of way. Given just how popular the music is and how far it has spread, Spectacular has ridden that wave and has ridden it for YEARS in building a terrific fan base, following and line of producers to work with throughout the whole of Europe. And he certainly isn't alone, I think of other Jamaican artists who have taken similar steps and made similar strides and can well include the likes of names such as Jah Turban (who, I believe, actually lives in Denmark or at least did at some point), Lorenzo, Hi-Kee from a few years back and others who have found large pockets of activity and successes in feeding Roots Reggae STARVED Europe and European fans. Within that scope, I'd actually put Spectacular at the head of that pack arguably as he has aligned himself with some of the biggest outfits and movements to the point where it never seems as if he is never too far out of the spotlight and, again, whether you realize it or not, he has already managed to have a stellar career in making Reggae music around the world. So let's take another step forward! Of course, if you follow his career at all THEE label with which you most closely associate Spectacular with is Irie Ites from out of Germany. Along with many Jamaican vocalists, Spectacular has become a big favourite throughout the years with the well respected imprint and, together, they have made some outstanding vibes (my personal favourite would probably be… 'Badda Than Dem', with 'Rasta' being a close second). So, at least presumably, one would have imagined that with all of the good music that vocalist and producer have made together across a span of time which stretches back to more than a decade now (just as was the case with the aforementioned Lorenzo who checked in with an album from II, "Movin' Ahead", back in 2009) . Nope. That's not the case. 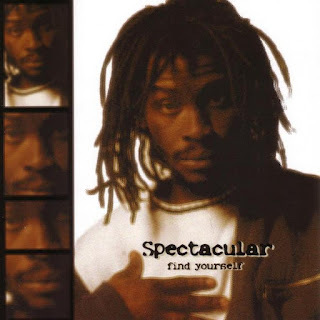 Initially, Spectacular made his debut on "Find Yourself", which released way back in 2005, via DHF Records which, I believe, is/was also out of Germany (the same label also did albums for Perfect Giddimani and Ward 21). In retrospect, "Find Yourself" may have been a better record than most people gave it credit for being, with the lasting tune being '50 Push Ups' ["Do fifty pushups, hundred skip yow! "], but it was a decent set for its time and, particularly how frequent Reggae albums came at the time, one would not have thought it would have taken nearly a dozen more years for a follow-up and, again, one not for Irie Ites. But that exactly has been the case as the fiery chanter now brings forth album #2, "Salvation". This set comes courtesy of Rastamusic Connection as well as Carabeo Music which're Spectacular's own labels, I believe. Hopefully, somewhere down the line there still comes an album from the veteran and Irie Ites, but until then, going through "Salvation", I'm going to find it hard to believe that established fans of Spectacular's, specifically, are not going to find a great deal to enjoy about the new release. Let me tell you about it. Okay, if you are not amongst his "established fans… specifically", Spectacular's style, as his name might indicate is very LARGE and aggressive. There are so many of his peers that I could compare him to but not entirely. Pick any of the 'usual suspects' (two of whom feature on this album) and you'll have an idea, but you have to include the caveat that only when they come through with a more forceful style. You're not going to get love songs and Beres Hammond (biggup Beres Hammond) moments from Spectacular and, as I said, he's managed to piece together a very impressive career for himself doing precisely what he does best (actually a pretty good comparison to make, now that I think about it more, would probably be someone like UT Ras) (biggup UT Ras, new album, "Up & About", in stores now. Old album, "Tha Bitter Stretch", which was better, still in stores). Spectacular gets busy putting those harsh skills on display with his brand new album, "Salvation, with a big tune in first, 'Taking It Easy'. I THOROUGHLY enjoyed the opener for this album because I took it in a way in which Spectacular is saying for everyone not to get so stressed out over everything and that life has more than enough of its own turbulences, inherently, that you really don't need to 'help' it out by finding strains and anxieties where they don't actually exist. He could live good and give praises to The Most High God"
Spectacular gives it all to The Most High and doesn't worry about small things on the sterling 'Taking It Easy'. Sometimes you can't go easy on everyone which the chanter is quick to remind us on the second effort on the album, the maybe even stronger 'Handle Dem Ruff'. Out of all the songs you'll hear on "Salvation", I think this one maybe makes as fine of usage of Spectacular's aggressive style as any of them. It isn't totally over the top but it definitely does have its overwhelming moments which I think was the intent and he ultimately uses that style, in contrast to the piece which precedes it here, to make the point that you can't be nice to EVERYONE… because everyone doesn't comprehend niceness (you know a whole heap of people like that - don't you!). And I also have to mention the riddim on that one which is excellent. Things slow down a bit as the title track comes through on the album named for it and it is, essentially, the solid praising tune that you would have thought. I do like this song, however, particularly for its vibe. When it gets going to its middle portions, 'Salvation' the song is absolutely delightful, a fine choice for a title and, appropriately, one of the best songs on the album. Combinations are fairly expected when it comes to albums, but you know you're always quite interested in seeing exactly WHO a particular artist taps to work with on their respective project and, for "Salvation", Spectacular chose wisely in a pair of instances (Rebellion The Recaller was on "Find Yourself", amongst others). First of all check the big social commentary, 'System Dread'. Featured here is none other than Lutan Fyah who, to my knowledge, has a musical history alongside Spectacular which stretches back VERY far, when both would have been near their musical nascence -- literally, ten or fifteen years ago -- and both have continued to work together on various ventures throughout the years. I don't know how many combinations there have been (PERHAPS my personal favourite would have been 'Coming Home' from the "Justice" album courtesy of Philadub Records) (biggup Gardian and Philadub, I wonder what happened to them), but 'System Dread', which I believe is a single from this album, has to rank amongst the very best the duo have produced thus far ["Babylon yuh system dread! DEM TEK AN ARM AND AH COME FI A LEG!"]. It probably rests more likely in the realm of fantasy (given just how infrequently Spectacular does full albums), but… I don't know… if someone wanted… to maybe do an album with Spectacular and Lutan Fyah… wouldn't be the absolute worst idea anyone has ever undertaken. 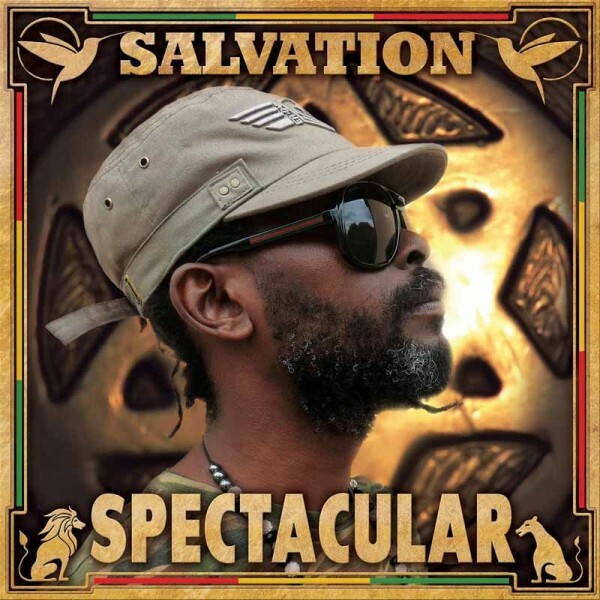 With that being said, however, one could rather easily make the case that Lutan Fyah alongside Spectacular is the second best combination on "Salvation" as 'Rise' is a FANTASTIC song. This one finds the Burning one joined by the legendary (have we gotten to the point where we can start calling him a 'legend'??? He'd surely decline, but I think that we're getting there) Anthony B. Everything on this one is BIG. Anthony B is big, Spectacular can't be anything else besides big and the riddim and the background singers are BIG! And that is quality which comes shining through immediately as 'Rise' begins. Lyrically, the two dazzle and throw a MAMMOTH praise to His Majesty on a beautiful drop which is not to be missed… and if they wanted to do this again, I wouldn't complain about it either. SPECTACULAR, ANTHONY B PAGAN DEM KNOW DEM TIME UP"
All of the remaining selections on "Salvation" stand out for their own various reasons. Certainly 'Things Been Good' has to considered one of the most interesting. I don't know that, at least musically speaking, Spectacular (with his style) is someone who you would instantly think of making a romantic type of song -- I don't think he has a "ROMANTIC" setting -- but he gives it his best shot and actually manages to impress. This isn't Cocoa Tea and, of course, he yells but it works on some level and manages to be a very pleasant piece to listen to, which is not something I would have imagined here. 'Nah Do No Crime', on the other hand, has less 'suspense' as Spectacular, basically, says the same thing I've been saying about life for year: I'm not trying to go to jail for ANYTHING or ANYONE. I love (some of) you, but I'm not doing it, I got stuff to do (… okay maybe I don't, but I'm still not going). This tune is all about a personal responsibility that we all have to at least make an attempt at being decent examples of human beings and I love that kind of direction. It isn't pointing a finger at anyone else. Spectacular wants YOU to take accountability for YOU and your own behaviour and to simply make better decisions in life because jail isn't a nice place to have to go and stay and, as Mavado once told us, there are no women there (this song reminds me of I Wayne's 'Total Annihilation' for some reason). Check 'Jah Children', which is actually the longest song on the album. There're songs here which I like more than it, but you'll do well not to overlook this effort because it takes a bit of time to grow on you or at least it did for me. Though fairly straight forward, it has an unusual kind of 'pace' to it in my opinion and just offers a subtly different sound than just about everything else on "Salvation" (and hopefully I'm not the only one who thinks that) (… but I probably am). Finally are two tracks which are genuine standouts for this album and, surely, amongst the very best that I have ever heard from Spectacular in any capacity. The first is the impassioned and Buju Banton-esque 'They Can't Stop Me'. Yes, I'm on the rise! I'm moving fast and I ain't moving slow! WHAT ABOUT CARING AND SHARING? YOU NO WAAN MI RISE, BUT MI TELL YOU SEH A MY TIME FI ACT!" BOOM! 'They Can't Stop Me' is the single best thing that I hear on the whole of "Salvation". There're moments here when everything aligns perfectly for Salvation and he thrills and it, like I mentioned in regards to 'Handle Dem Ruff', makes a nearly perfect usage of what Spectacular's style is and what he does well. BOOM AGAIN! And lastly (literally, it's the final song on the album) is the fiery 'Big or Small'. There is a point and message here of how people change over time for no real reason at all, but I have to confess that I'm taking 'Big or Small' for its vibes! It is a POWERFUL set which gives the listener not an inch of space (BECAUSE YOU DON'T DESERVE IT!) and, for me anyway, it's just the final burst of energy one would have loved on an album like this as Spectacular misses no opportunity at all to bring his own trademarked edge to the music. I do have a standing critique of "Salvation", but I find myself mentioning it so often these days that it may just be on its way to becoming more of a sign of the times, rather than just a point on a specific album [after eleven years, you'd think he have more to say than just ten songs!!!]. So I'll stop whining about that… or will I??? Overall, I have to say that I was THRILLED to see Spectacular come with a new album. It has been so long that it isn't something that you'd look at and say that you're so thoroughly anticipating it, but as has been the case with others who have taken similar steps in recent times such as Q'Shan Deya from a few years back or even Utan Green (new album, "I & I Culture" in stores now), who have made returns with album releases after a long absence: It just makes you feel good! It was just a good idea and the thought of 'why not' jumps into mind right away! In this particular instance, it isn't as if Spectacular has been difficult to find for the last decade or so, it's been quite the opposite, but hearing him in this type of form is sure to not only turn up quite a few new fans, but also reenergize and REWARD a group who has made him quite successful. So, while we do wish it could have packed on just a few more pounds during its decade+ long gestation period and it will be a DAMN SHAME if I have to wait until 2027 for its follow-up, "Salvation" is SOLID and a fine display of the high level of skills of someone in Spectacular who, whether you always realize it or not, just keeps strolling right along. Well done.